Capt’n was excited to hear about this Friday top five suggestion and it has taken him two weeks to come up with the perfect list. Since all of these have occurred under some sort of stressful condition, I did not think to take photos, so I don’t have any of the actual “save.” If I could find photos of the general area where the save occurred, I included them below. So here we go…. Capt’n took a dinghy ride at Green Turtle Cay, Bahamas in March 2012. As he was coming back to the boat, he saw a grounded boat. But have no fear, Capt’n is here. Capt’n once again saved the day. The boaters were really stuck and weren’t sure how they were going to get into deeper water. Capt’n sped toward the boat and ran into it on the port side and kept revving the motor until the sailboat heeled over and found deeper water. Capt’n says, all in a day’s work! This save happened while we were on our friend’s catamaran, crossing the Gulf Stream for the first time in March 2012. We had been in Riviera Beach Florida for almost a week waiting for a weather window to cross the Gulf Stream. We had about a day and a half of good weather before the winds got too strong to cross. We left early in the morning, crossed the Gulf Stream and arrived in West End, Bahamas rather painlessly. We patted ourselves on the back as we were glad to be in the Bahamas as the storm picked up. We had a restful night’s sleep and woke up refreshed the next morning. We were going for a walk along the beach when we saw a catamaran slowly limping in to West End. They pulled in right behind us and Capt’n helped tie the lines to the dock. The boaters looked awful. They looked exhausted and frustrated. Capt’n asked how they did with the storm the night before. The boaters had an awful crossing getting caught in a storm with strong winds and huge waves. The boat had a self tending jib and the block and tackle got torn off the deck and destroyed in the storm. The boaters were happy just to make it to West End. They were not sure what they were going to do as there were no marine shops or mechanics for miles and miles…..except for Capt’n. Capt’n was more than happy to help. He used his excellent rope work skills and made a few soft shackles out of rope, gave them two blocks, and made a great temporary rig until they could get to a boat repair shop. We saw the boaters three weeks later and they were still using the temporary rig and said it was better than the original! This save also occurred while we were on our friend’s catamaran but during October – December 2012. We had been in Fort Lauderdale, Florida for the international boat show and to wait out Hurricane Sandy and were leaving to sail down to Key West to haul the boat. The boat owner was in Barcelona on business, so it was Capt’n, Capt’n in Training, the boat owner’s inexperienced friend (who had never gone sailing before in his life), and me. It was early in the morning and we were quickly approaching Port Everglades. All of a sudden the boat started to “shiver and shake” on the port side. Capt’n stopped the boat and anchored right in the middle of the channel. He put the boat in reverse and something came to the surface. Capt’n took a boat hook to bring in the culprit. A black plastic contractor’s bag got caught in the port prop! The bag did not seem to damage the prop so we pulled anchor and continued on our way. Not five minutes later, the starboard engine alarm sounded, the alternator light went on, the temperature light went on and alarm sounded. Capt’n heard flapping and knew it was the fan belt. We pulled in to the shallows and anchored while Capt’n replaced the fan belt….and forty minutes later the same fan belt broke! Thank God we had enough spare fan belts. We were all traumatized at this point and were wondering what else would go wrong that day. FYI – other things did go wrong: one of the winches broke and we didn’t make clearance going under a bridge (by an inch!) and broke the anemometer. 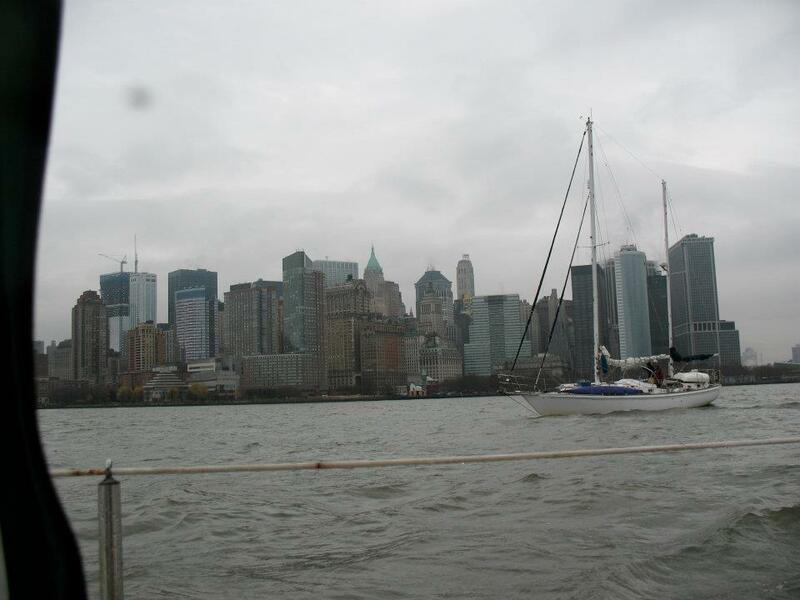 When we started sailing down the East Coast in November 2011, we couldn’t wait to sail through Hell’s Gate, in New York City. I have seen the East River plenty of times during my visits to the Big Apple, and was looking forward to sailing (or rather being swept up in the current) down the East River. We were buddy sailing with a friend from Connecticut to New York and spend the previous day looking at the charts and working out the currents. We had to leave early if we were to make it through Hell’s Gate with a flood current. 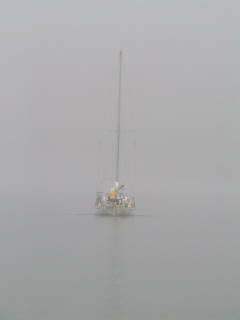 It was early December 2011, cold, rainy, and foggy. Not ideal conditions for….well, anything. But nothing could take away from our excitement. When we began that day’s voyage, we were off to a great start. I took photos of everything (yes, in the fog – I was that excited). We were only about three to four weeks into our trip and we were still nervous about sailing next to large barges, tugs, etc…A tug towing a barge was approaching and I was getting nervous and Capt’n put the throttle on and tried to move to the starboard most side of the channel. However, when Capt’n turned up the throttle, the engine stuttered and Capt’n could not move to the side of the channel. The barge was getting closer and closer. Then to make matters worse, the engine stopped altogether. At this point I was convinced that the barge was going to hit us and the boat was going to sink. So I had created a mental escape plan, choosing what belongings were going to come with me as I swam to shore with Capt’n, Capt’n in Training and the three dogs….But while I was working on my escape plan, Capt’n ran down to the engine room to see what was wrong. I was trying to steer the boat the best I could, and at this point our friend turned around and motored next to us so he could help us avert any potential collisions. Capt’n discovered that our fuel filter was completely clogged, and switched the fuel filter within ten minutes. When he said he changed the filter in ten minutes, I said, no way, it was an hour! Well, it seemed like an eternity to me. After all, I was the one who could see all the boat traffic while all Capt’n could see was the boat engine. 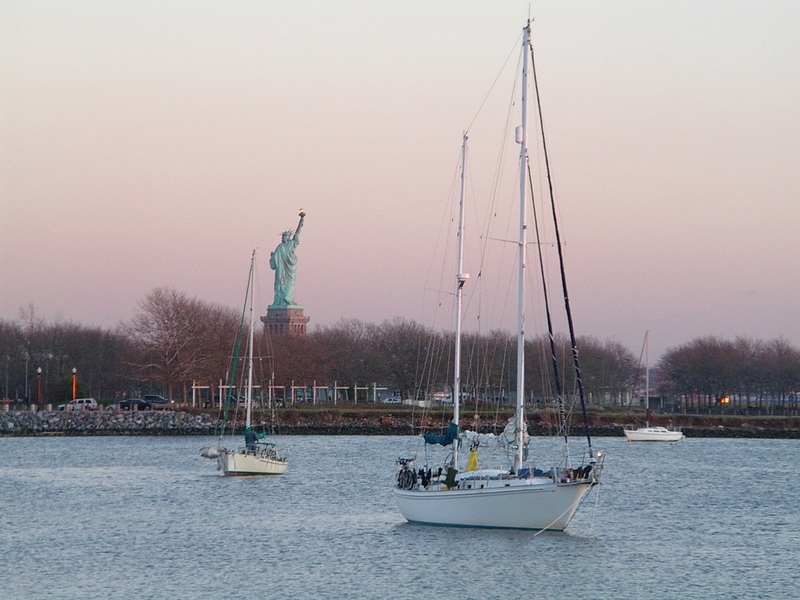 Needless to say, once Capt’n replaced the fuel filter, we had a great time going through Hell’s Gate, and spent about four nights anchored behind the Statue of Liberty. 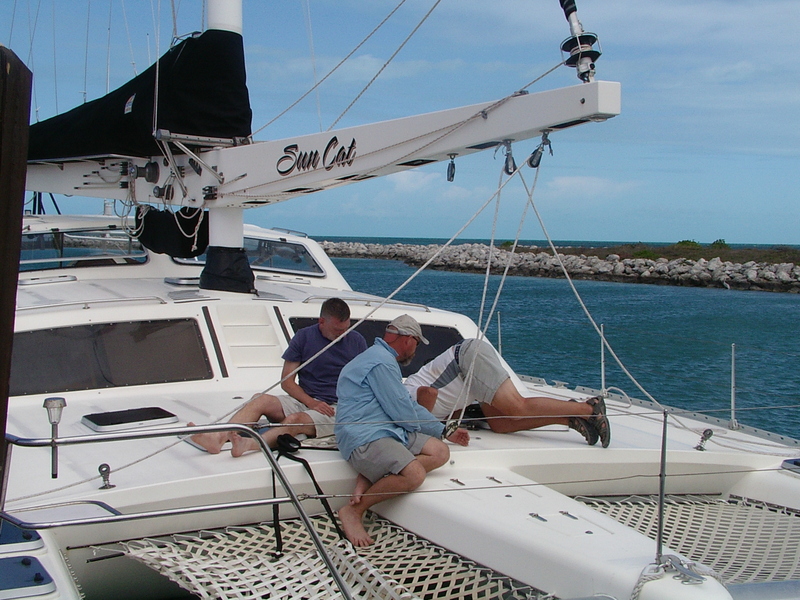 We helped a friend bring his catamaran over from the Bahamas to Florida in October – December 2012. Capt’n was getting the boat ready to cross the Gulf Stream. Capt’n was cleaning up the ropes at the base of the mast, and I was doing laundry. I remember specifically telling Capt’n that he had Capt’n in Training duty as I was going to be on and off the boat doing laundry. I came back from doing laundry and I saw Capt’n and Capt’n in Training in the water. I made some sort of joke about them taking a swimming break….and then I heard the real story. Capt’n was working on the ropes while Capt’n in Training was playing on the trampoline at the bow. Capt’n said everything was fine and he turned his head for one moment and then heard “splash!” Capt’n in Training got on one of the seats in the bow and lost his balance and fell overboard. Capt’n jumped right in and saved the day. Capt’n in Training was perfectly fine but now Capt’n and I have very specific rules about Capt’n in Training on deck and our responsibility when we supervise him on deck. We hope that these top five saves encourage you if you had similar problems, or made you laugh at how we get ourselves in these predicaments. In any event, Happy Friday!